Public Watchdogs researchers have uncovered confidential internal documents by Holtec, the manufacturer of the defective “HiStorm” nuclear waste trash cans that are being deployed at Southern California Edison’s newly constructed Beachfront Nuclear Waste Dump. We expect Edison employees to use the talking points at tonight’s (June 27) Community Engagement Panel Meeting on nuclear waste in San Clemente (click here for details). The secret documents represent what Public Watchdogs calls a “Spin Doctor’s Public Relations Playbook” to be used by Holtec employees, and probably Edison’s Chief Nuclear Officer, Tom Palmisano, to deflect embarrassing questions about Edison’s defective nuclear waste containers. At issue is the fact that steel bolts, which are designed to help cool the hot nuclear waste and hold the deadly radioactive waste safely in place during transport and storage, have broken in at least four of the canisters that have been deployed at San Onofre. Edison’s Chief Nuclear Officer, Tom Palmisano, admitted to the defect at the March 22, 2018 Community Engagement Panel meeting. Curiously, the document also makes 14 alarming admissions and claims that are not only disingenuous, but so ridiculous that they seem bizzare. We have cataloged those admissions and strange claims below. #3 The “improved design” was not approved by regulators. Point #3 contains a frank admision by Holtec that it did not notify the Nuclear Regulatory Commission (NRC) that Holtec has changed the design of its nuclear trash cans. Therefore, the new design did not undergo a design review process by the NRC. This claim asserts that completely changing the design of the cooling functions of a nuclear waste container by replacing custom fabricated solid metal components with bolts similar to what you can buy at a hardware store is perfectly acceptable under NRC safety rules. #4 At least four defective cans have been loaded at San Onofre. #5 The defective, leaking cans cannot be moved without risking lethal doses to workers. #6 Emergency backup equipment is unnecessary. The author claims that despite the fact that the cooling system for the hot radioactive waste has broken bolts, a safety system, such as Hot Celll, for repairing a leaking canister is unnecessary. Further, the spent fuel pools are also unnecessary because submerging a damaged can inside the pool will increase the risk of damage to the protective cladding that covers the spent fuel. #7 An apology, now that Holtec is the subject of an NRC Corrective Action Request (CAR). Due to the fact that Edison’s Chief Nuclear Officer, Tom Palmisano, has found bent and broken shim pins (bolts) in the cans, Holtec is now under an NRC investigation. The author also offers an apology, stating “We are sorry for the inconvenience to our stakeholders … ” Presumably, those stakeholders include the 8.5 million people who live within the 50-mile plume zone identified by the NRC. #8 Holtec stopped loading defective cans … then it started loading them again. 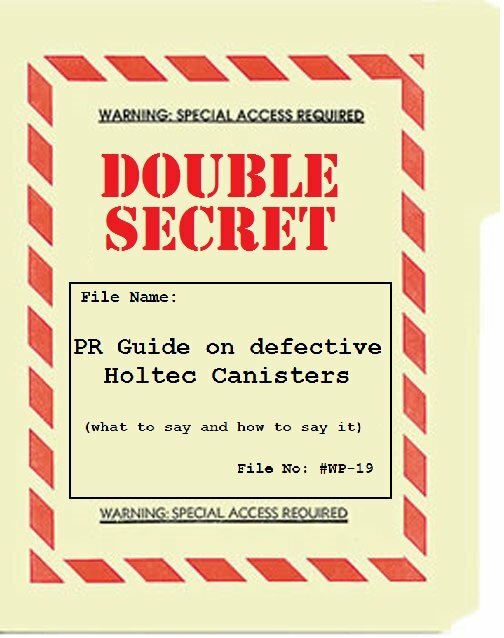 Holtec stopped loading its defective canisters at every one of its U.S.A. facilities. It then started reloading the nuclear waste into the same defective can design almost immediately afterwards by claiming to the NRC that the bolts “serve no safety purpose.” They did this despite the putative fact that the purpose of the bolts is to hold heavy aluminum safety shims in place. The safety shims are supposed to stabilize the fuel assemblies and allow for air flow to cool the hot nuclear waste. Contrary to public claims made by Southern California Edison’s Chief Nuclear Officer, Tom Palmisano, damaged canisters can be repaired, but should not be done for “frivolous” reasons. The author fails to explain why repairing a leaking canister would somehow be “frivolous,” claiming that under no circumstance would damage to a Holtec can justify the danger of making a repair. #10 Holtec will not respond to statements made by its clients in the media. Holtec refuses to comment on press releases issued by Southern California Edison. #11 Holtec has never stored nuclear waste as hot as Edison’s. Edison’s high-burnup fuel is twice as hot as anything that has been stored in one of Holtec’s thin-walled cans. However, Holtec’s hypothetical computerized models show that the cans should be able to handle the heat load. (It is noteworthy that Edison’s Replacement Steam Generators failed in a haze of radioactive steam after its similar computer models predicted that the generators were safe). #12 Holtec will take no special precautions for storing damaged nuclear fuel. Point 12 is a frank admission that no special precautions will be taken for handling a damaged fuel assembly. #13 It is okay to move cans with cracks. The spin doctor claims that moving cans with cracks is perfectly safe. What’s more, the cans will be moved before through-wall cracks can occur. Despite a disturbing report by the Nuclear Waste Technical Review Board in December of 2017, which recommends that nuclear waste containers be maintained, monitored and retrievable, there is no credible risk of an explosion at the SONGS site, according to Holtec, therefore an inspection plan is not necessary. Critics have called the defective canisters used by Holtec “Mobile Chernobyls” because each of the 72 cans contain more deadly radiation, on average, than what was released during the entire Chernobyl Disaster. The redesigned Holtec Containers were not approved by Federal Regulators. Located just 108 feet from the sparkling surf and sugar sand beaches of San Onofre State Beach Park, the Southern California Edison Beachfront Nuclear Waste dump will be the USA’s largest privately operated nuclear waste disposal facility. The giant canisters contain deadly spent nuclear fuel that remains radioactively lethal to human for the next 250,000 years, and areonly guaranteed by the manufacturer to last 25 years. Edison has assured the public that the unique design of its thin-walled cans are robust enough to handle terrorist attack, tsunamis, earthquakes, and salt corrosion. San Onofre State Beach Park was named after Saint Onuphrius, who was known for producing lavish meals out of thin air in his desert home. After Saint Onuphrius died, his body was wedged into a crack in the rocks because the ground was too hard to bury his remains. His corpse was devoured by carrion eating animals and his remains dispersed to the four winds. Like its saintly namesake, the Beachfront San Onofre Nuclear Waste Dump is located in an area completely unsuitable for the burial of nuclear waste. Get involved: Sign the petition.